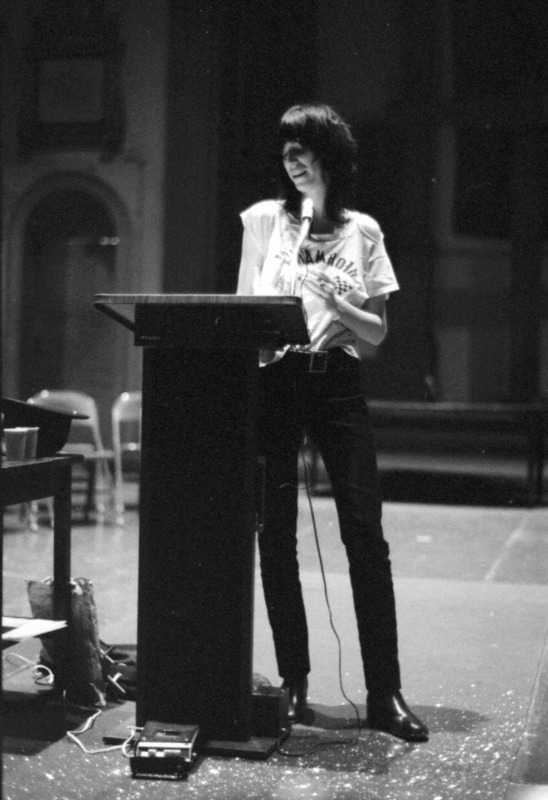 Via the Poetry Project at St. Marks, I came across this brief video posted by the music site/magazine NME featuring Patti Smith, called “My First Gig: Desecrating a Church with Electric Guitar.” Smith talks about her first performance “worthy of remembering,” which was a poetry reading she gave on February 10, 1971, at the Poetry Project at St. Marks. Smith’s reading that night was quite unusual and controversial, as it included an electric guitar punctuating her poems and also featured her singing some songs. As she tells it in this interview: “I was quite young in my early 20s with extreme amounts of agitated energy. I wasn’t content to just stand there and read poetry. I wanted to perform my poetry in the way that I was learning from Jim Morrison or Jimi Hendrix or the great Beat poets, and also I liked to sing a little, so I injected a little song within my poems.” She asked the guitarist Lenny Kaye to add a little “interpretive electric guitar” in the midst of a poem of hers about a car crash. (Note: Patti Smith’s February 1971 reading is also discussed in detail in Daniel Kane’s terrific in-depth exploration of Patti Smith and the Poetry Project, which appeared in the collection Among Friends: Engendering the Social Site of Poetry. Philip Shaw’s book on Horses for the 33 1/3 series also opens with a detailed description of the event. Some of Smith’s early performances can be found at UbuWeb, here, though not this one. However, a recording of the February 1971 performance is available on CD). This entry was posted in Allen Ginsberg, Andy Warhol, Anne Waldman, Beats, Gerard Malanga, Lou Reed, Music, Patti Smith, Poetry Project at St. Marks, Video. Bookmark the permalink.